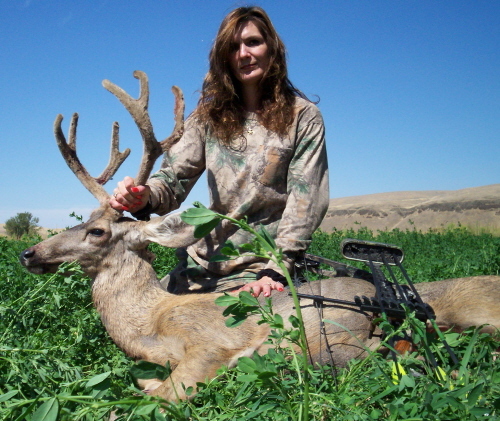 As the warm, late-summer sun slipped slowly behind the ancient cottonwood and box elder trees that lined north-central Montana’s Milk River, the big buck at last slipped out of the low brush, easing himself further into the open of the alfalfa field. Each step brought him closer to the round bales of hay I was using as cover. And, to what I hoped would be his demise. 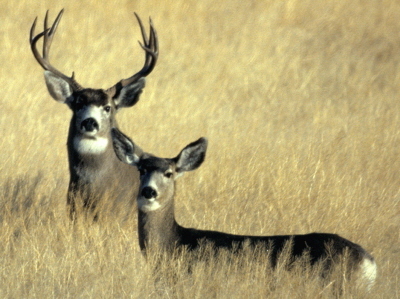 from crawling through the recently irrigated hay, but nothing could chill the fire within me as I watched the twenty-three inch four by five Mulie slowly work his way across the newly mown half of the field. It was this new mown area that had thwarted my advance. It was relatively easy, if not quite comfortable, to crawl, guerilla style, across a half mile of foot-and-a-half high alfalfa to reach the strip of road that separated the two fields. The area between this haul road and the river breaks were, however, a no-man’s land as far as my stalk was concerned. The huge bales had been removed and stacked at the end of this same road only yesterday, leaving a wide stretch of open ground that greatly resembled the green felt top of a billiard table. There was not enough cover across this stretch to give safety to a jack rabbit, as witnessed by the two sets of long ears pointed skyward from atop these gangly lagomorphs about three hundred yards from my hideout. Slowly, I watched as the big buck followed the band of twelve does and two younger bucks across the open ground, bound for the lush, uncut hay. As the distance diminished, the adrenaline in my system increased. I had never had the opportunity ever in my life to be this close to such a buck. 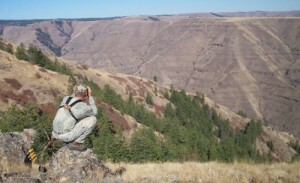 I had never dreamed prior to this excursion, it would be possible for a single hunter, unfamiliar as I was with the country to be able to hunt a private ranch that held so many really nice bucks as I had seen the past three days of hunting without it costing me at least the promise of my next born. At two hundred yards, he was still coming straight on. As he approached, to one who had grown up hunting first the Blacktail Deer of northern California, then, subsequently, the Whitetail Deer of Virginia and South Carolina, he looked enormous. Fortunately, by this time, I had taken quality bucks of both species and had successfully hunted the huge Roosevelt Elk that inhabit the Pacific coast from northern California to British Columbia, Canada. The experience helped to minimize my case of Buck Fever. Never, though, had I seen such a deer. As he came inside one hundred yards, this Buck Fever I thought I had left behind manifested itself anew, my previous experience notwithstanding. My hands shook; I knew my knees were clattering so loudly he would surely have to hear me. I was still breathing only because I was forcing my lungs in and out. So magnificent was this Mule Deer that, when my TLR-75 rangefinder would finally register him (inside seventy-five yards), I was sorely tempted to shoot, but resisted, knowing that his path was good and, by following that band of does, he would pass within forty yards of me. I did give in to the fever enough to not ever take my eyes from him. Perhaps it was this that warned his sixth sense, or, more likely, it was merely the perverseness that is Mule Deer that caused him, at sixty-five yards to turn ninety degrees away from my spot and begin to leave me behind. to get there and, since I had to eat wherever I was, I felt I could probably continue that trend as well. I do tend to eat a bit higher off the critter when I’m hunting, but felt I could probably sneak that by the bookkeeper as well without too much stress. My major obstacle, then, was where to hunt. Should I hunt public land, or would it be possible to get permission on a private ranch? I knew I couldn’t afford to waste three of four days scouting and knocking on doors, so I was in a bit of a quandary when a light came on in my mind. The only thing I really needed was local information. There had to be someone I could access to provide the information I sought. It occurred to me, after much deliberation, that I was a member of a church that had congregations in every city and town in the U.S.A. and much of Canada as well. Why couldn’t I contact someone from the church there, introduce myself and simply ask if anyone in the congregation was a hunter, and, knowing hunters proclivity for conversation, just contact this person and prime him a bit with the right questions and see what came about. The results were spectacular. I first visited my own leader and told him what I had planned. He showed me a book that listed the name, address and telephone number of every leader of every congregation in the world within this church. I told him the area I was interested in and he provided me with three or four of these contacts. I then called the first person on the list and hit the jackpot. Not only was HE a hunter, but most of the congregation were hunters. 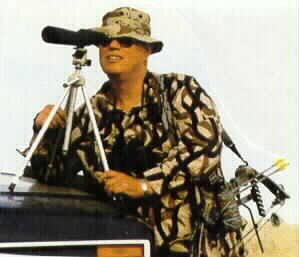 In fact, I was invited to join a group of them on their annual deer/antelope extravaganza that fall. Admittedly, finding hunters in a congregation in Montana is not exactly the most difficult quest one would have in their life. It’s a bit like searching for a Catholic in Rome or a Mormon in Utah. I explained my desire to hunt pretty much on my own, with my bow, not a rifle. He then suggested I contact a local game warden who just happened to be a member of his congregation as well. In the meantime, he was very insistent on the fact that I would be most welcome to join his party. I demurred while thanking him profusely for the contact he had given me, meanwhile assuring him that if I could not make contact through this game warden, I would contact him again and, yes, I would let him know when I was in town so we could get together over a coke. permits and would welcome some hunters coming in to lower the burgeoning population. This population was getting out of hand and most of the hay the ranch was putting up was going towards feeding a bunch of free-loading deer instead of the cattle that depended on the ranch to provide their winter feed and upon whom he depended for at least part of his livelihood. The warden passed my phone number along to a rancher who, it happened, was also a member of the same church. Although I really expected to have to follow up and remind him a time or two, to my surprise, just a couple of nights later, I received a call from Aaron, the ranch owner, asking me how many I planned to bring with me. He seemed rather disappointed that it was just me and that I was really not interested in taking extra does, even though, at that time, it was just a matter of buying some extra tags at fire sale rates. He told me he was feeding over two hundred deer full time out of each of his alfalfa fields, to say nothing of all those who roamed his four thousand plus acres of cattle range without coming to the hayfields. I did purchase one extra tag and used it to take a nice dry doe which I donated to a widow Aaron knew who lived in the area. If it had been my desire, I could have repeated this exercise time and time again. When I arrived, Aaron showed me a great place to set up my camp, away from the river with its hordes of mosquitoes and very private, set back in a coulee with ample water, even for my sun shower. Even my porta-potty was fairly well concealed. Before dark, he had driven me the length and breadth of his ranch, showing me crossing and bedding areas, feeding areas and property lines. He outlined his safety zone around his buildings for me. He then insisted I join him and his family for dinner. It was a very special, this evening of fellowship among people with whom I shared a common faith. …Panic built up within me as I saw him escaping with me able to do nothing to prevent it when, from somewhere inside my panic driven mind, I remembered the set of antlers I had in my day pack. I had no idea whether they’d work or not, I’d never tried them on a live deer. I only had them because a friend at home had stuck them in my gear, telling me he’d had great success with them. I had no idea how to use the silly looking things, but recalled a video I’d seen where the hunter, in Montana also, I believe, had recommended just tickling them together. What had I to lose? If I did nothing, I surely would lose this beautiful buck as there was much too little light remaining before the end of legal shooting hours this day. Quickly, I dug the rattling antlers out of my pack and, peering around the bale, looking very much, I’m sure, like some sort of peeping Thom, I gently ticked the antler tips together. The buck continued to walk. A bit louder I tried again, sending a prayer heavenward that He might intervene. To this day, I’m not sure what caused it, the prayer or the rattling, but that buck STOPPED. His head swung back in my direction, his eyes riveted on the area where the sound had originated. I waited, now breathless, for what seemed an hour, but which was probably two to three minutes maximum. His ears, one of which had still been pointed the direction of his travel, slued around like some kind of huge SETI earth station antenna. His entire being was now focused on this sound he’d heard. I waited until his ears began to pivot back around, again searching his outside world for some auditory hint of danger, before I rattled again… softer again this time. Again, his ears popped back towards me, but, this time, his body began a slow turn back. I could not believe what I was seeing, but he was actually responding to my effort. Once more I tinkled the antlers together, a bit more urgently this time and he began walking toward me. I put the antlers down and merely watched him while clutching my bow tightly in my hand. On he came, like a sled on rails, directly toward me. His eyes locked on my position, his radar-like ears doing circular scans of his environment while his nose was testing the air currents for any sense of evidence to feed his cranial combat information center. I saw no reason to rattle further as he was inexorably closing the distance between us, which created another problem. I do not like head on shots on deer with a bow. They are low-percentage shots which can result in a badly wounded deer which may take hours or days to track and retrieve, if, in fact, retrieval can ever be effected. At extremely short range, however, an arrow can be slipped between the breast bone and the shoulder and into the lungs. I don’t usually recommend this shot, however and was certainly not contemplating it with any degree of pleasure here. On he came, step by wary step he advanced closing the distance surely and steadily. Fifty yards, thirty yards, fifteen yards, closer and closer he came, all the time searching his surroundings for evidence of the bucks he sensed were just behind those bales from him. At eight yards, he stopped, looking intently in my direction, making it impossible for me to come to draw on him. We were at an impasse, this buck and I. Again, fate intervened when a doe who had moved on into the standing alfalfa chose this moment to blow and stomp her foot in the manner of disturbed deer everywhere. On hearing this, the buck turned his head to see what her concern may be. I took this opportunity to come to full draw, slowly raising my bow to bring the buck’s chest into the sights of my Martin bow. He evidently sensed my movements, as slow as they were, because he snapped his attention back in my direction, but the damage had been done, I was now in shooting position, sitting flat on my posterior, my feet stretched out before me, my bow aligned on his body and my fifteen yard pin aimed just to the right of the centerline of his chest and at the lowest point I felt would be a vital hit. As he watched me, I simply touched the trigger on my release and watched excitedly as my arrow disappeared into his chest, exactly where I wanted it. The buck spun away from me, spraying a fount of blood in doing so, and began his bounding attempt at escape. Within forty yards, his strength waning, he collapsed in a heap, issuing a weak kick or two as he expired quietly on the bare field of alfalfa. I have since used this arrangement with similar results in three different states to take Pronghorn, Bear and Deer. It is effective and efficient, as well as being really fun. I love meeting people I share a faith with. It renews my own faith in my fellow man as well as strengthens my spiritual values. In every case, I had a wonderful hunt and met wonderful people. I did not always fill my tag, but I’ve never really felt that to be a necessary criterium for a great hunt. Especially as I get older, the idea of actually have to care for an animal becomes less and less appealing. It seems the HUNTING is more the point than the taking. In every case, I have followed up my hunt with a gift and my profuse thanks and have never not been asked back. This method is open to a great majority of people. Even if you have no access to the name and address of the leader of your church in your chosen area via a book such as I had, you do have access via the Internet to every local phone directory in the nation. Simply access http://www.Yellowpages.com/, select the business listing, enter the city and state you desire and select CHURCHES and you will see the numbers of every church in the surrounding area by denomination. Other areas that might yield similar results are such things as service clubs, such as Rotary or even Toastmasters International, fraternal organizations like The Fraternal Order of Eagles or professional organizations. Even labor unions transcend state and international boundaries. Another source of information on potential hunting grounds can be found on the Internet. There are three major avenues on the web to find a great place to hunt. Probably the simplest way is to visit sites such as www.bowsite.com and participate in the discussions there. Friends are easily made and I have enjoyed many days hunting with such friends as their guest. In turn, I’ve invited several such to enjoy the hunting I have here. I have standing invitations to hunt the large whitetail of Illinois and the Greater Kudu of South Africa; the great bears of Alaska and the moose of the Yukon as well as the elk of Colorado and the boars of Texas. All of this has come from friends I have made in the various hunting chatrooms online. Another avenue of investigation along this line would be those sites which publish offers to trade a hunt. A cousin to this method would be those who are looking for a hunting partner. Some few years ago, I posted a notice of one such site and received a reply from a man originally from England who was living currently in the Seattle area. Ian told me that he knew nothing about deer and deer hunting beyond what he’d seen on television, which told me there would be a deal of “unlearning” to effect before learning could go forward, but he was very interested in hunting. He had built his own bow from native yew wood, a beautiful thing, I saw later, and he was practicing diligently with it. We met several times over the summer and I showed him my country. I introduced him to the Mule Deer of the inland empire, then the whitetails that lived along the infrequent waterways of the desert steppe country I call home. When season arrived, I took him to a wooded copse along a good sized stream, set him up and retired to await a result. Not the first morning nor even that evening did he meet with success, but ultimately, he harvested a whitetail doe that could not have weighed eighty lbs of the hoof with his tiny, self-made bow and neither he nor I could have been more proud had it been a Pope and Young qualifier. It was a Trophy with a capital “T”. Whether one chooses one of these methods I’ve outlined here, or opts for a guided, outfitted hunt, I urge you to do it NOW. I’ve done it and now, as age and injury debilitates me to the point where such trips are increasingly relegated to the realm of what was, I have their memories to feed my soul through the cold nights of winter. Money is always a concern for the vast majority of us and I have never seen a case where it was a matter of too much. Of course, we cannot cause hardship in our family and debt should never be contemplated. I recently read an account of four men who conducted just such a hunt as I have outlined on Prince of Wales Island near Ketchikan, AK where the four men took four Pope and Young record book quality bear with their bows. Their costs, from portal to portal, including airfare, licenses, tags, food and boat rental was approximately two thousand seventy dollars per man. If a person planned and scheduled this hunt for three years from today, and put away fourteen dollars per week, his trip costs would be totally covered. Increasing this to twenty dollars per week would make the trip possible year after next, while just forty dollars per week would have us on our way next year at this time. By way of a hint here, add an extra couple of dollars to your stash each week and, just prior to your hunt, use the extra to do something extra special with your family. It will pay big bonus dividends the likes of which you will not believe. The secret here is to be consistent and to treat yourself with honesty. A little forethought and planning will have you hunting with the finest people in the world in the greatest spots in the world at a price you can afford without busting the family budget.